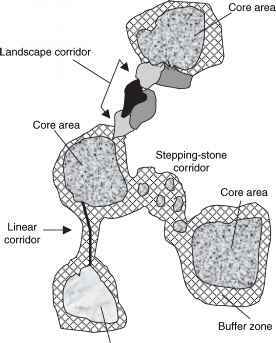 Quantitative sampling of enchytraeids is often done with cylindrical core samplers that keep the soil intact. Optimum sampler size is 57.5 cm in diameter (van Vliet, 2000). Because enchytraeids show clumped distributions, sufficient replicates need to be taken to estimate population density and composition. However, the size and number of the sampling units is mostly chosen as a compromise between accuracy of the abundance estimates and the amount of work involved (Didden, 1993). FIGURE 9.6. 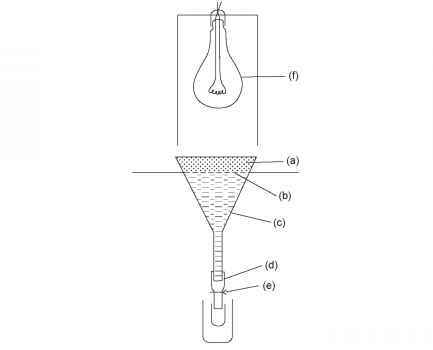 Modified Baermann funnel to extract enchytraeids: (a) soil sample, (b) wire-gauze sieve, (c) funnel, (d) rubber tube, (e) funnel outlet with spring clip, (f) 25-watt light bulb (from Gorny and Gram, 1993). into the water below. A modified extraction method was described by Graefe (1973) and Schauermann (1983) in which enchytraeids are extracted from soil without heat. Extraction time is extended to several days for soils rich in organic matter and up to 2 weeks for mineral soils. The time of extraction is limited by the possibility of an oxygen deficit in the water, which may kill larger organisms. Didden et al. (1995) compared the two methods and found more efficient extraction without heat. The length of the cold extraction period and the total extraction time had a significant positive influence on the extraction efficiency. The Graefe (1973) method is less expensive and easier to set up, but the long extraction time makes it more difficult to handle large numbers of samples. The O'Connor (1955) method is faster and can be modified with a longer initialization period before heat is applied.